Richard and I during one of our many talks about what he wanted. This conversation centered around his medication. Having “The Talk” does not have to be hard or difficult, yet the talk does have to happen at some point in our lives. I’m not referring to the birds and the bees talk our parents have with us when we are adolescents. 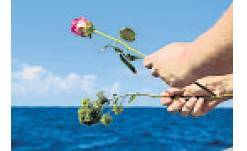 “The Talk” I am referring to is the talk we have with our loved ones about end-of-life wishes. As a caregiver, one of our most important roles, if not the most important one of them all, is to be an advocate. How can one advocate if you do not know the wishes or desires of the person in your care? Richard and I always had the ability to talk openly about his wishes. In fact, our end-of-life conversation happened spontaneously; by the end of the conversation, our tears of love and joy were comforted by the knowledge that I knew exactly what he wanted. 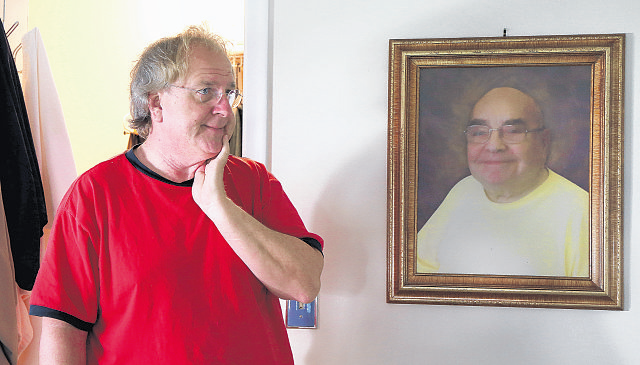 “I will tell you when I am ready for hospice” he bellowed…Yes you did! Recently I had the opportunity to visit with Jack Tatar who has written a book called “Having the Talk.” “Having the Talk” focuses on ways to begin a family discussion earlier rather than later, about planning for the later life issues of a retired or retiring parent. Jack’s research demonstrated to him people have “the Talk”, but they have it too late, either when there’s little that can be changed, or after expectations have been set by siblings about “who gets what.” When this happens, families are torn apart, and loved ones who played together and protected each other throughout their entire lives now find themselves not talking to each other, usually all the way to their deathbeds. Use examples of family and friends. I believe there are two common aspects to caregiving that everyone experiences, there is a beginning and there is an end, and in most cases, we are not prepared for either one of these life changing events! It is difficult to plan for the unexpected, but having a plan in place does help temper the confusion when an emergency happens. Have the talk…you will be glad that you did! 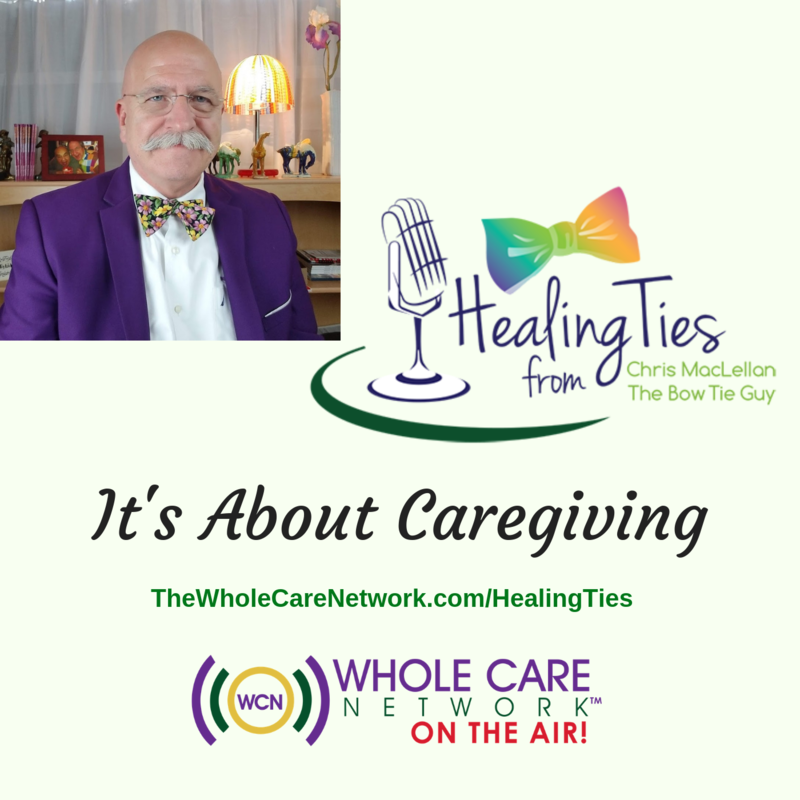 Christopher MacLellan, MA is a Certified Senior Advisor, Certified Caregiving Consultant, the author of “What’s The Deal with Caregiving?” and the host of “Healing Ties™” podcast. 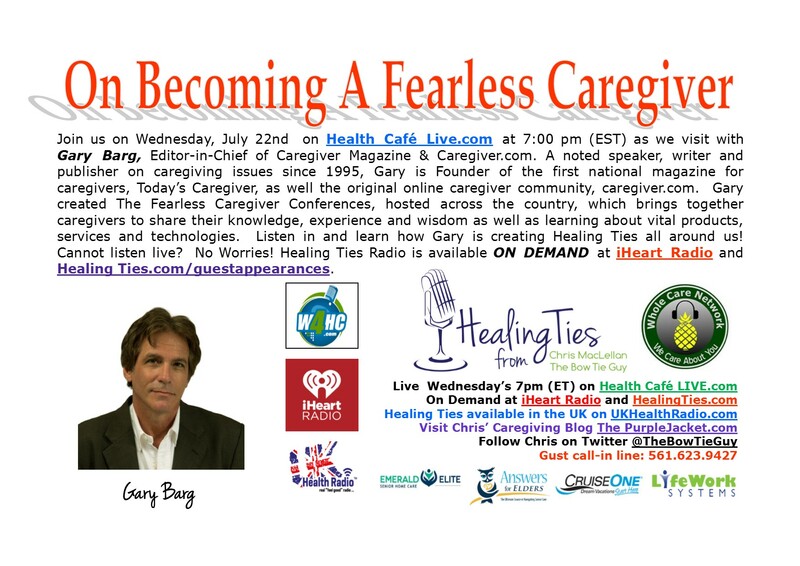 All rights reserved ©WholeCareNetwork, Inc.
Join us on Wednesday, July 22nd on Health Café Live.com at 7:00 pm (EST) as we visit with Gary Barg, Editor-in-Chief of Caregiver Magazine & Caregiver.com. A noted speaker, writer and publisher on caregiving issues since 1995, Gary is Founder of the first national magazine for caregivers, Today’s Caregiver, as well the original online caregiver community, caregiver.com. Gary created The Fearless Caregiver Conferences, hosted across the country, which brings together caregivers to share their knowledge, experience and wisdom as well as learning about vital products, services and technologies. Listen in and learn how Gary is creating Healing Ties all around us! Cannot listen live? NO Worries! Healing Ties Radio is available on demand on our iHeart Channel by simply clicking here. You can also find Healing Ties Radio on UK Health Radio by clicking here. 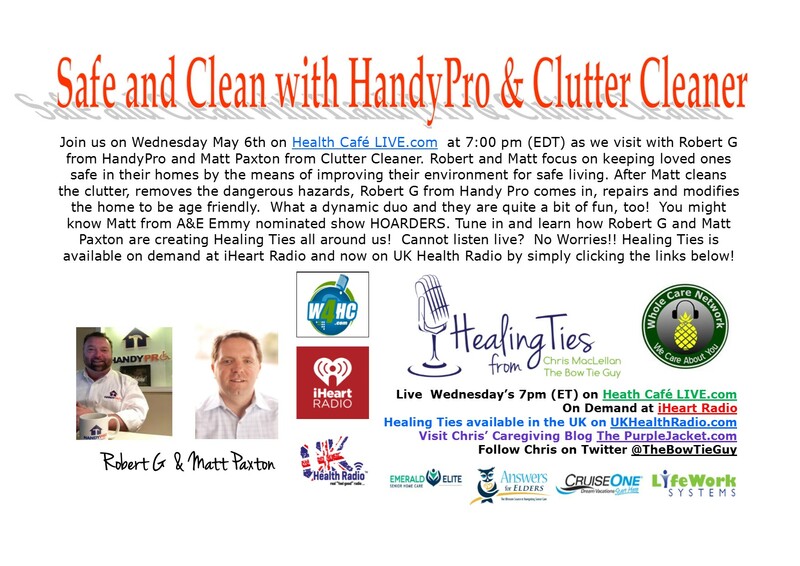 Visit ‘HealingTie.com/guest-appearances for all our shows by clicking here. Or visit our Healing Ties Facebook Page to listen to all our shows by clicking here! Relief, Sadness, Guilt, and Joy all rolled up into on simple statement. Yet how do four very different words, have meaning to us when Caregiving ends? 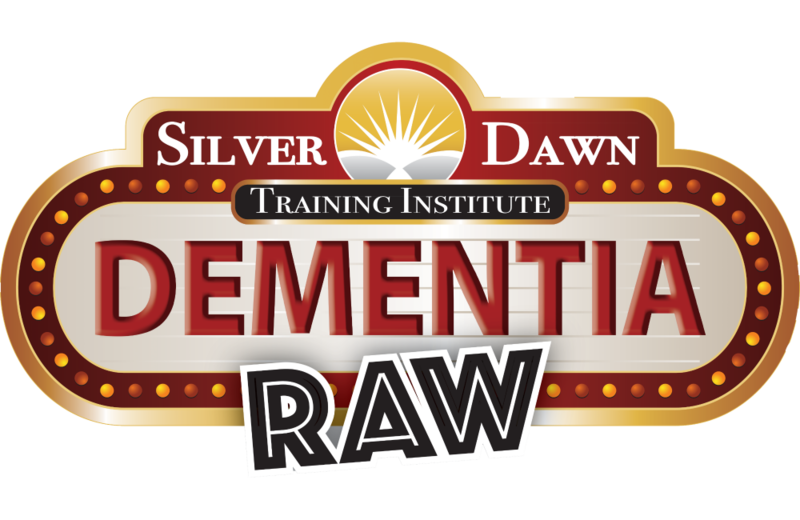 I believe that these four words are the first emotions that a family Caregiver deals with when the journey ends. 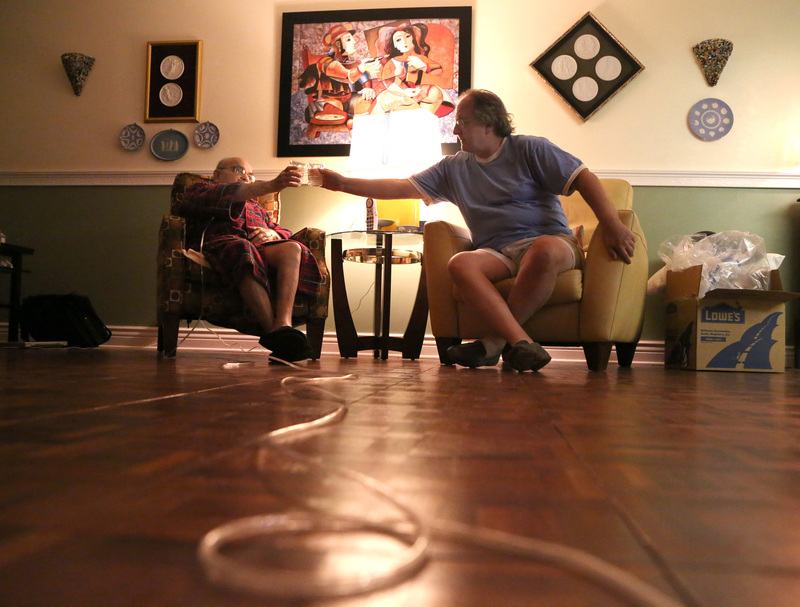 Relief: That caregiving is over. Those long sleepless nights, sleeping with one eye open, are gone. 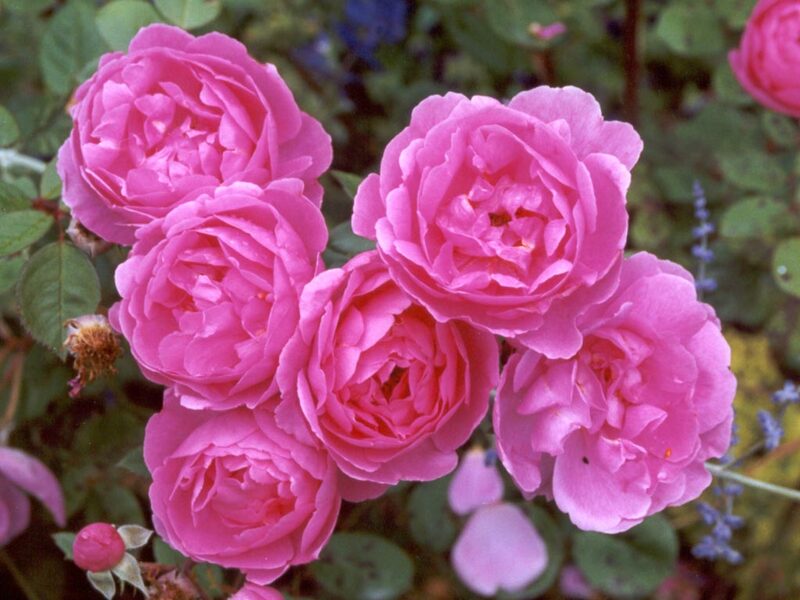 Relief that the one you (loved) cared for is now pain-free. Sadness: That the life you once knew has now forever changed. That undeniable reality that something powerful has happened that has forever transitioned our lives and the one that we (loved) cared for. For every Caregiver, the stark reality is that there is always a beginning and an end to the journey, and in most cases, we are not prepared for either of these events! Yet through our caring and sharing with others, we realize that through our own journey of Relief, Sadness, Guilt and Joy, we find peace and comfort, knowing that we would do it all over again, even after seeing the staircase! Special Needs Traveling: NO PROBLEM! 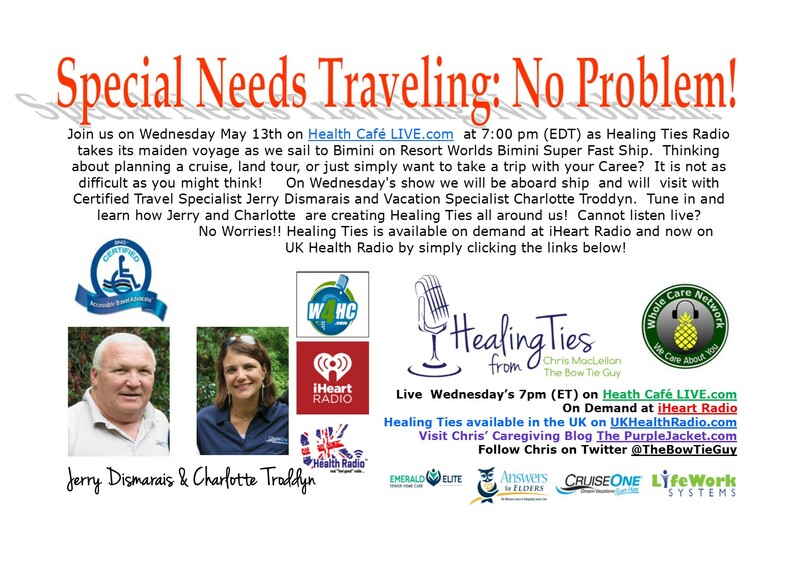 Join us on Wednesday May 13th on Health Cafe LIVE at 7:00 pm (EDT) as Healing Ties Radio takes its maiden voyage as we sail to Bimini on Resort Worlds Bimini Super Fast Ship. Thinking about planning a cruise, land tour, or just simply want to take a trip with your Caree? It is not as difficult as you might think! On Wednesday’s show we will be aboard ship and will visit with Certified Travel Specialist Jerry Dismarais and Vacation Specialist Charlotte Troddyn. Tune in and learn how Jerry and Charlotte are creating Healing Ties all around us! Cannot listen live? No Worries!! Healing Ties is available on demand at iHeart Radio and now on UK Health Radio. To listen live on Wednesday on Health Cafe Live, simply click here! Because You Care: Wear Green on April 17th! Loneliness and isolation are some of the common side effects when caring for a family member or friend. Yet wouldn’t be great if you could somehow spot another family caregiver in the crowd to lend support, or to simply give a ‘high-five!’ Well, Denise Brown from Caregiving.com and her vast network of family Caregivers are pledging to wear green to bring awareness to the family Caregiver experience on April 17th. Learn how you can get involved in this nation wide event by tuning into Healing Ties Radio on Wednesday April 8th at 7:00 pm (EDT) on Health Cafe LIVE! You can also visit Caregiving.com for additional information on this terrific event to support family Caregivers. Not available to listen live? NO WORRIES! Healing Ties is available on demand on our Healing Ties iHeart Channel by clicking here! 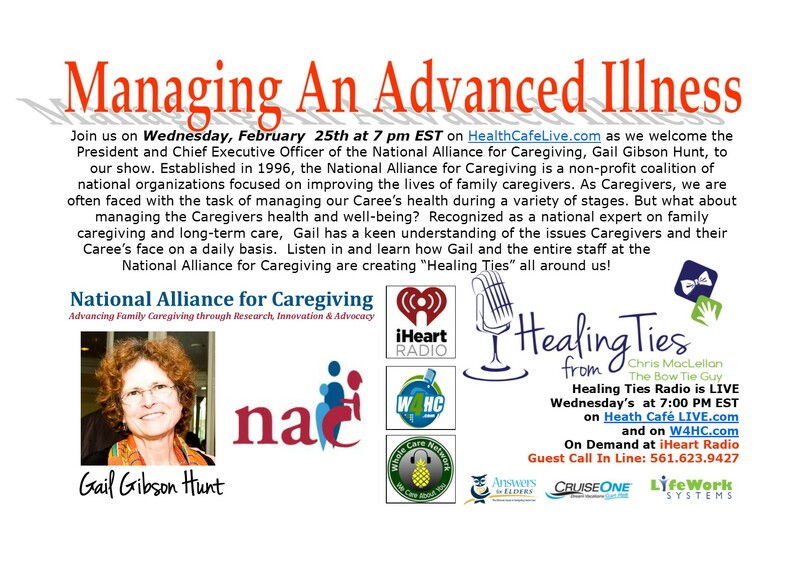 Join us on Wednesday, February 25th at 7 pm EST on HealthCafeLive.com as we welcome the President and Chief Executive Officer of the National Alliance for Caregiving, Gail Gibson Hunt, to our show. Established in 1996, the National Alliance for Caregiving is a non-profit coalition of national organizations focused on improving the lives of family caregivers. As Caregivers, we are often faced with the task of managing our Caree’s health during a variety of stages. But what about managing the Caregivers health and well-being? Recognized as a national expert on family caregiving and long-term care, Gail has a keen understanding of the issues Caregivers and their Caree’s face on a daily basis. Listen in and learn how Gail and the entire staff at the National Alliance for Caregiving are creating “Healing Ties” all around us! Not available to listen live? NO WORRIES! 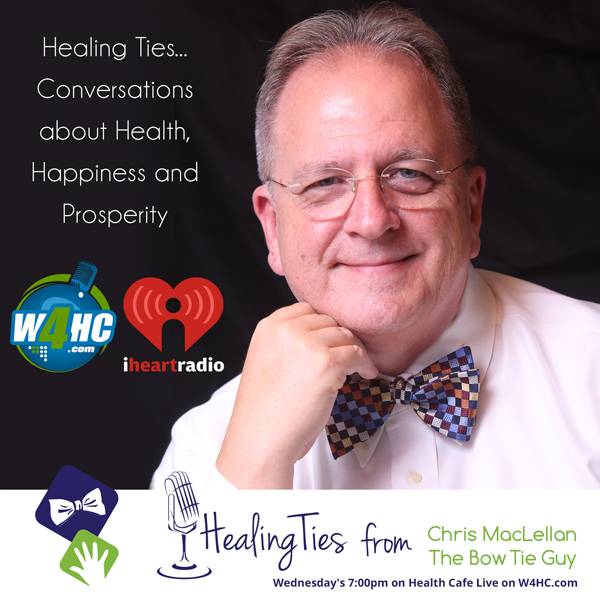 All of our episodes of Healing Ties are available on demand at our iHeart Radio Channel by clicking here! 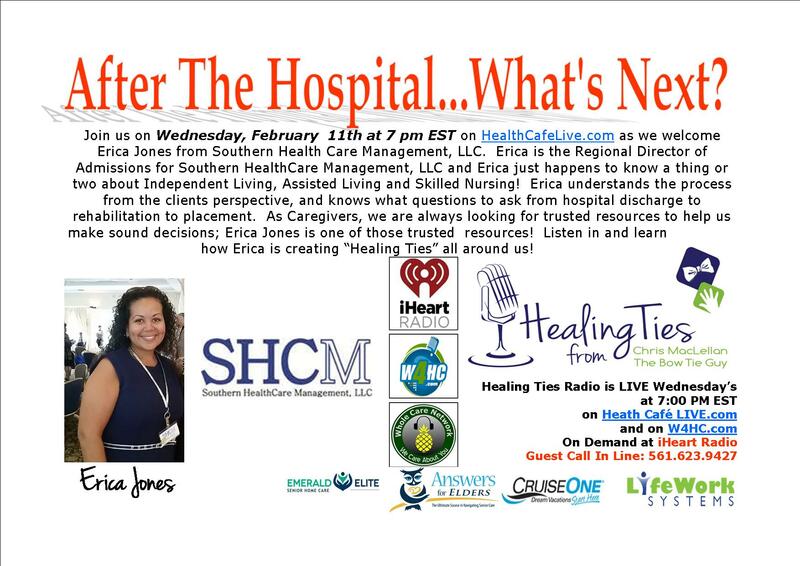 Join us on Wednesday, February 11th at 7 pm EST on HealthCafeLive.com as we welcome Erica Jones from Southern Health Care Management, LLC. Erica is the Regional Director of Admissions for Southern Health Care Management, LLC and Erica just happens to know a thing or two about Independent Living, Assisted Living and Skilled Nursing! Erica understands the process from the clients perspective, and knows what questions to ask from hospital discharge to rehabilitation to placement. As Caregivers, we are always looking for trusted resources to help us make sound decisions; Erica Jones is one of those trusted resources! Listen in and learn how Erica is creating “Healing Ties” all around us! To Listen live on Wednesday at 7:00 pm (est), simply click here! Busy tonight, cannot listen live? NO WORRIES! Healing Ties is available on demand on our Healing Ties iHeart Channel by clicking here!